Janet Bea* crouched down and covered her head. Her breath came in short bursts. She was about to leave for work, and this was happening, once again. She didn’t know why, or how. Her mind began racing, and she couldn’t stop shaking. She reached for her phone. She couldn’t go to work, not like this. Bea called into work and cancelled her shift so another cashier could take over. Then, she reached for her bong. “I have really severe panic attacks and anxiety when it comes to working,” Bea says. 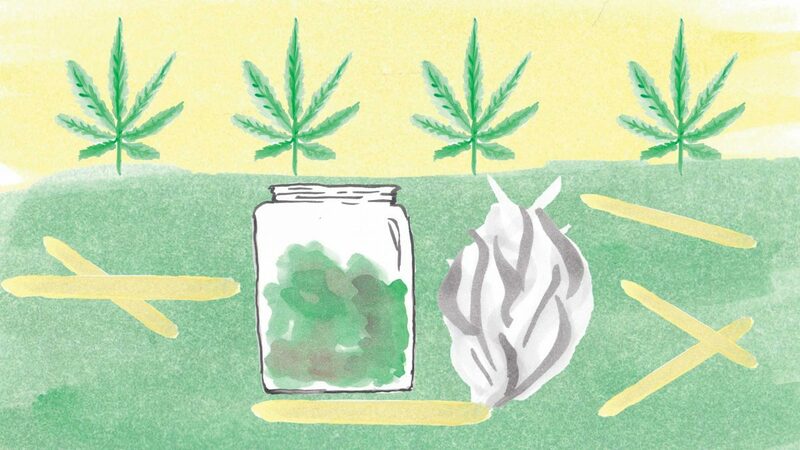 Bea has been using medicinal marijuana for years to help ease her anxiety and panic attacks. This is not the first time, and she doesn’t think it will be the last. Bea has been medically assessed and is unable to go back to her job, or any other job. After a while, her breathing slows and her shaking comes to a stop. It takes an hour or two for her to feel normal again. Sometimes, it takes far longer. She smokes a bowl to calm her nerves. She sits back and focuses purely on breathing. 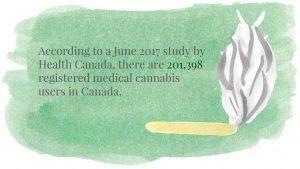 According to a June 2017 study by Health Canada, there are 201,398 registered medical cannabis users in Canada. Provincially, the most users are in Ontario, at 86,196. With marijuana legalization coming up, the importance of weed has become more mainstream. People who smoke weed have their eyes set on July 2018, the set time for legalization. Data suggests that not everyone is in favour of legalizing marijuana. According to a poll performed by Abacus Data in January 2016, 38 per cent are in favour of legalization and 38 per cent are not. 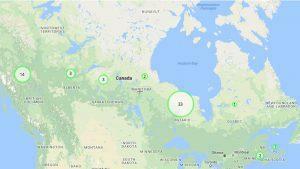 The remaining 24 per cent expressed limited interest in legalization. But there are still many questions to be answered, and for now, it is not exactly set in stone on how the Liberal government will go about legalization, or how will it impact medical users, especially those here at Ryerson. At Ryerson, in the heart of downtown Toronto, marijuana smokers can be seen frequenting various places on campus at all times of the day. Ryerson’s policy on smoking is clear; you cannot smoke in buildings, residences or any property the school owns. While the university doesn’t own the space in between buildings, they do own the nine-metre space from the front of each entrance, making smoking in these spots prohibited. If you find yourself on Gould or Victoria streets, you can technically smoke beyond the nine metres, as these properties are owned by the City of Toronto. As of right now, even if the drug is for medicinal purposes, students won’t be allowed to smoke it on campus. Other universities have already had these discussions. McMaster University recently banned all smoking—including marijuana—on its campuses starting January 2018. The University of Toronto has plans to do the same, but it remains to be seen how the ban will be enforced at its St. George campus, which includes public sidewalks and roadways. Dr. Melanie Kelly, a professor of pharmacology and ophthalmology at Dalhousie University, and her PhD student, Elizabeth Cairns, both foresee big changes for medical users like Bea, in the coming age of legalization. Both argue that Canada must have two “streams” of marijuana available: recreational and medicinal. For the use of medical marijuana, there has been substantial evidence that cannabis is effective for chronic pain and nausea as a result of chemotherapy, and effective in the treatment of multiple sclerosis, according to The Health Effects of Cannabis and Cannabinoids. There are also reports of medical marijuana having an impact on the treatment of arthritis and epilepsy. Reports from Harvard Health state that medical marijuana use shows promise for treating anxiety, substance-use disorders, schizophrenia and psychosis. However, Kelly points out that long-term use of cannabis in some cases can lead to a higher risk of schizophrenia and psychosis. But for recreational marijuana users, the drug serves a different purpose. Cairns says that recreational users are looking to get intoxicated through a high concentration of tetrahydrocannabinol (THC). THC is the component that is responsible for feeling high after use. Medical users may not be looking for THC, but instead, other chemical constituents, like cannabidiol, which has no psychoactive properties, but rather medicinal benefits. But with legalization, it’s likely that vendors will be looking to cater to recreation users, says Kelly, meaning products would be more skewed towards them. 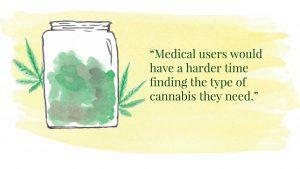 Medical users would have a harder time finding the type of cannabis they need. Some patients are concerned that they will lose access to specific strains (for example, strains with lower levels of THC) because these strains would not entice recreational users, according to A Framework for the Legalization and Regulation of Cannabis in Canada. Similarly, there are concerns that patients who use high-potency strains would also lose access because of limits placed on THC potency. sing marijuana, and that it is important that you trust your source. “You could come across something that’s highly concentrated and dangerous and you might just not know that it’s dangerous,” says Cairns. She maintains that buying from a regulated source is the safest option. Currently, Toronto Police continue to raid dispensaries, forcing buyers to get their marijuana from other, less reputable sources. Bea has to rely on dispensaries to get her supply. Even though her doctor approved of her using the drug, they weren’t comfortable prescribing it to her because she’s only 22. Her usual dispensary, Canna Clinic, has been raided multiple times, forcing her to go back to her dealer, where she couldn’t be 100 per cent sure about the strain of her marijuana. When Liam McGregor*, a 20-year old professional communications student at Ryerson, first brought up the idea of medical marijuana to his doctor, he wasn’t nervous at all. He was quite sure, in fact, that this would be a viable option for him. McGregor sat in his doctor’s office, waiting for his appointment. When he finally got called in, he sat down and told his doctor why he was there. His doctor went over all of the uses and details of medical marijuana, ensuring he was well-informed. She wasn’t shutting him down, but listening to him. Once he got the green light from her, he ran with it and never looked back, jumping into experimentation with edibles. Mondays feel long for McGregor. He starts his day at 5 a.m. and doesn’t get home until 10:30 p.m. On days like these, he uses edibles to lull him to a restful sleep. The first time he used edibles to sleep, he made them himself. He isn’t a big fan of the way smoking cannabis makes him feel. He’s a big health freak and diligently did his research beforehand on what amount was good for him, how to bake them, and the ingredients he could use. He stepped into his kitchen and got to work. Deciding to make muffins, he added coconut oil, cinnamon, nutmeg, cardamom, vanilla extract and saffron to a bowl and got mixing. Then, he added the cannabis. He baked one batch with raisins and dark chocolate, and one with just dark chocolate. He cut one in half, ate it and headed to bed for the night. He woke up after 10 hours. In hindsight, half a muffin might have been too much for him, as he didn’t plan on sleeping for that long. But hey, at least he got some sleep. The problem with Canada’s regulations on edibles is that there aren’t any. Regulations for edibles will soon have to be established as the clock ticks down toward legalization. At a recent House of Commons committee on the Liberal’s proposed cannabis bill, an NDP health official pointed out that prohibition doesn’t and won’t work on edibles, and hasn’t in the past. Conversations at Health Canada mentioned putting a gram equivalent to the dried cannabis in edibles to help guide people in their use. Without regulations that are put into place, those who use medical marijuana through edibles will have to switch to smoking, or make their own edibles with strains that may not be medically suitable for them. Cairns warns that it’s important to keep in mind that just because a drug becomes legal, it does not mean that its without risks. The Health Effects of Cannabis and Cannabinoids: The Current State of Evidence and Recommendations for Research also details that there is substantial evidence of an association between chronic cannabis smoking and worsened respiratory symptoms, including more frequent bronchitis episodes. McGregor says there needs to be more education on why people use the drug for medicinal purposes. “If you look at our generation, we’re a lot more open to almost everything and I feel like that’s due to how we were raised,” says McGregor. Previous generations, he says, have a stigma against using the drug. In 2012, Statistics Canada ran the Canadian Community Health Survey – Mental Health, where 43 per cent of Canadians reported that they had used marijuana at some time in their lives. Marijuana use was indeed more common and more frequent among 18-to-24 year-olds than in any other age group. Less than one per cent of those aged 45-to-64 reportedly used cannabis one to three times a month. 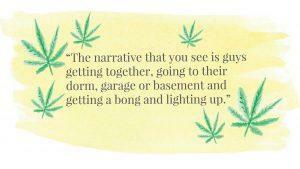 “The narrative that you see is guys getting together, going to their dorm, garage or basement and getting a bong and lighting up,” says McGregor. He says that this is inaccurate, as the issues surrounding medical use are often more complex. But is Canada ready to deal with these complexities? Things are still in the works. Police continue to make arrests for possession of pot, so it’s abundantly clear that marijuana isn’t legalized until it’s legalized. Cairns says she thinks the government is leaving a lot of the regulations up to the provinces, which worries her, but overall, she doesn’t know if Canada will be ready for such a change. And right now, it’s unclear as to how Ryerson or other universities will deal with students who use medical marijuana. There’s still time until next July, and time for many things to change. For now, it’s up in the air. After consulting her doctor, Bea was ready for the next big step: consulting her mom. When she was feeling confident, after a lot of consideration, she took a deep breath, sat down with her and looked her straight in the eyes. Bea took her time explaining why she wanted to try, why she was intrigued, what had happened and how she smoked it. Her mother was worried that Bea would become hooked on it for fun. But the more they talked, the more understanding she became. She was just happy that her daughter was comfortable with talking about it. “She’s been there, she’s been my age and all that,” Bea says. Bea knew for a fact that even if her mom didn’t approve, she wouldn’t get angry. She loved her and had complete trust in her. She knew everything was going to turn out alright. Bea still continues to use medical marijuana every day to help with her anxiety and sleep deprivation. For now, it’s not legal. But it is enough. *The names of these people have been changed to protect their identity. Our company is putting pressure on the government to protect a percentage of the supply of cannabis for the medical community. We would love the opportunity to speak with someone on this if you’re interested. I heard that California is getting rid of their medical system after implementing their recreational system. I hope that’s not the case in Canada. I’m one of the people who want marijuana to be legalized, some city have been approved it but some are not and still in the discussion if they will or no. But I think this can be legalized because it has a good effect in our community especially in a medical way. As i read this https://www.worldwide-marijuana-seeds.com/blogs/marijuana-news/how-should-america-proceed-with-marijuana i know that it can help all of us soon when it is legal in our country. Just saying. After reading your article I’m able to understand what scene behind the legalization of cannabis for medical purpose. Many research works have been done on uses of cannabis for medical purpose. It has given positive result many of times. Medical cannabis is already prescribed to thousands of people across Canada to treat everything from pain to disorders like Crohn’s disease. I appreciate your blog you have been shared, Its useful to clear the misunderstanding about uses of cannabis for medical purpose. Just to be very clear the government’s plan to legalize cannabis is not in any way helping us to obtain cannabis. It sole purpose is to tax people more. The truth is that the insurance companies should have instituted a drug number for medical marijuana in the beginning for medical marijuana and company benefits should have been in place long before recreational marijuana use was legalized. The insurance industry has been ripping off users from the beginning. I agree with legalized marijuana but it is different than medical cannabis. It should be dealt with accordingly.